today we’re going to talk about how to add nice and cool chat box to blogger blogs. do you have a blog? whatever your blog talking about. you will need to add a chat box. to connect people. that’s why you build your blog. right? the box that we going to use it here presented by cbox.ws. I guess you saw the chat box before at many blogspot blogs. and here is an image tells you how it looks. click on “sign up” link. then you’ll see a form. fill it and choose the style you like. there is 12 different styles. then check on “I have read and agree to the Cbox terms and conditions of service” box. and click creat my box. if every thing is fine. you’ll see theis message. Your Cbox, adfasfsdf, was created successfully. and you are now ready to take your chat box code and add it to your blog. 1 : log in to your account at cbox.ws by the user name and password that you’ve just created. once you loged in you’ll be at your Control Panel Home. you’ll see top horizontal menu contains 5 links. Publish! : we’ll talk about it later. 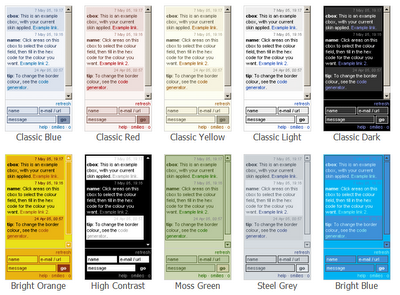 Look & Feel:here you can manage your chat box style. like layout options, style gallery, edit style, or edit css. Options:here you can adjust your posting options, date options, smiles and filtering options. Users & Access: manage your users and access. Messagesyou can check your messages here. and here is some styles for the box. after that. we’ll back to Publish! link. Publish! : here you’ll find the code that you will need it at your blogger account. find ” I’m installing on: ” and choose “blogger”. then follow the next steps. Step 1: Get your code. select all and copy it. Step 2: log in to your blogger account, go to layout section.and click add new element at your template sidebar where you want to add the box. choos html / jave. Step 3: past the chatbox code. and click save. if you faced any problem. please leave your comment here. 0 Respones to "how Add cool chat box to blogger"